I'll be attending the ACDelco NHRA Gatornationals this year, my first trip to Gainesville Raceway in many, many years, and I'm looking forward to seeing how the old gal has changed. The new tower will provide a great backdrop to the annual Florida classic and it will be really cool to see the old Gators mascot up on the wall there. In case you missed the story, a sculpture of the famed "gator on wheels" logo is being built to hang on the side of the tower. Just a few minutes after I posted that story on NHRA.com on Friday, Associate Editor John Jodauga, who was a member of the DRAGSTER staff back in the 1970s before leaving to open his own advertising business (and subsequently returning in 1993), proudly announced that the iconic racing reptile was his creation. Jodauga, as many of you may know, is a skilled artist whose works have adorned press kits and, for years, were featured in National DRAGSTER. He brought with him as proof the first issue (somewhat wrinkled … sorry) bearing the grinning gator and also shared this recollection of its creation. "I was still in my first year of employment with NHRA when Wally Parks asked me to come up with a logo for the inaugural Gatornationals event in 1970. It was one of the three races that were being added to the previous schedule of four events, which prompted that year to be dubbed as the 'Super Season.' NHRA was a very small company then, with the headquarters staff consisting of about 18 employees. Accordingly, many of us had to double-up on our duties, and I was given the dual assignments of art director and reporter for National DRAGSTER. "The best thing about those days is that it gave us all a chance to work directly with Wally and his wife Barbara on many varied assignments. National DRAGSTER had always been one of Wally’s favorite projects, and Barbara was in charge of the specialty publications, such as national event programs. "Because there were no corporate event sponsors at the time, Wally wanted the logo to simply tie in with the name of the event, much in the same manner that the famous snowflake was a part of the original Winternationals logo for years. So I came up with a rough sketch of an alligator with a pair of drag racing slicks in place of his rear legs, and put a steering wheel in his hands. 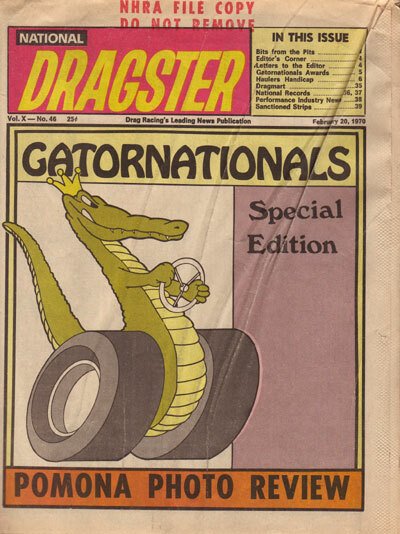 After getting Wally’s initial approval, I drew up the logo in the cartoon style that I had developed over the years as a big fan of Walt Disney comic books, and it was used as the cover for the Gatornationals Souvenir Edition of National DRAGSTER. "I enjoyed the fact that the logo soon appeared on the starting line A-board and was also used on T-shirts to promote the event. But never in my wildest dreams did I imagine that it would be rendered in sculptured form as part of a major renovation project at Gainesville Raceway nearly four decades later." The idea of an animal on wheels is certainly not unique. 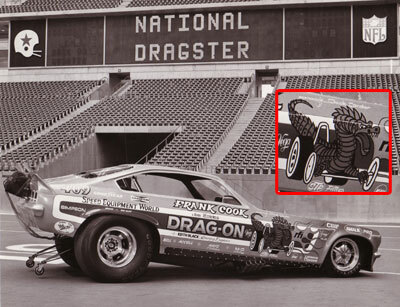 Reader Pete Davis of Clatskanie, Ore., recalls seeing wheeled dragons as logos in Hot Rod Magazine back in the late 1950s and Texas Alcohol Funny Car legend Frank Cook used various wheeled dragons on his Drag-On line of cars in the mid 1970s. The ever-resourceful Cook was well connected in Texas and knew how to play to the editors of DRAGSTER. He posed his new Vega on the playing field of the Dallas Cowboys stadium for this 1973 publicity shot, and even got the scoreboard operator to cooperate. He had all of the angles covered. Readers of this column are well-known for their love of Hot Wheels cars, but none of us ever had one like this one. 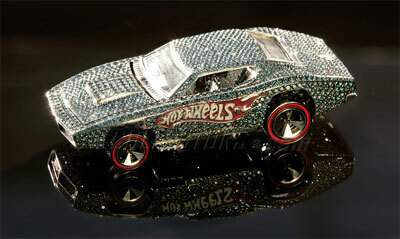 At the 105th American International Toy Fair Feb. 16 in New York City, Hot Wheels announced its year-long plans to celebrate the brand’s 40-year heritage and kicked off with the unveiling of this custom jeweled 1:64-scale Hot Wheels car, designed by celebrity jeweler Jason of Beverly Hills. According to information provided by the company, "This one-of-a-kind car, the most expensive in Hot Wheels history, was made to commemorate the production of the 4 billionth Hot Wheels vehicle. The diamonds on the custom-made jeweled car, valued at $140,000, total more than 2,700 and weigh nearly 23 carats in total weight. The car is cast in 18-karat white gold with the majority of the vehicle detailed with micro pave-set brilliant blue diamonds, mimicking the Hot Wheels Spectraflame blue paint. Under the functional hood, the engine showcases additional micro pave-set white and black diamonds. The Hot Wheels® flame logo found on the underbelly of the car is lined with white and black diamonds. Red rubies are set as the tail lights, while black diamonds and red enamel create the “red line” tires. The custom-made case that houses the jewel-encrusted vehicle also holds 40 individual white diamonds, signifying each year in the legacy of Hot Wheels. The vehicle was unveiled by multi-platinum recording artist and car enthusiast Nick Lachey, who grew up playing with the die-cast car line. In late 2008, this unique Hot Wheels vehicle will be auctioned off to benefit Lachey’s charity of choice, Big Brothers Big Sisters." And finally, speaking of DRAGSTER staffers and valuable stuff, former Bracket Racing Editor John Miller, who now lives in Colorado and works for Pro Stock racer V. Gaines in his Fineline Graphics company, dropped me a line to tell me about a cool move by one of Gaines' other business, Western Distributing Transport Corporation, which last Sunday helped move the Federal Reserve Bank of Seattle. Western provided five armored tractor/trailers and two tow trucks and moved just short of 1 billion dollars of currency from the old Seattle FRB facility to the new facility 15 miles away. The trucks and drivers were protected by Secret Service, SWAT, local police, and even a Coast Guard helicopter.